Cutaneous Neoplasm – Pop Quiz Friday – 10/5! The patient declines surgical intervention for this cutaneous neoplasm and a decision is made to pursue medical therapy. 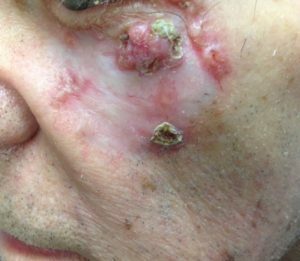 What is the most common side effect of the FDA-approved medication for this cutaneous neoplasm?